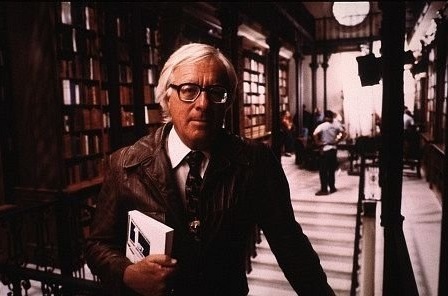 Bradbury: Forever one of my heroes. Fortunately, it is not possible to reach through the computer and slap people. I'd be in trouble if this were an option. See, this blog/comment stuff can be really cool. Or not. Don't misunderstand me. People should be allowed to be as stupid as they want. And smart people sometimes say stupid things. Conversely, stupid people can wind up going all Forrest Gump and shining a light into the dark places for those of us who doubted them. So everyone should be allowed to speak. "Man, that at-bat would have been better if you had hit the ball. It was, at best [they love "at best"] a poor showing by a mediocre athlete. The problem is, the place in the air in which you swung did not contain the ball. Everyone knows, to get the bat to hit the ball, the two have to occupy the same place at the moment of contact. Maybe you would be a better hitter if you considered that." I can just see them hitting "publish" with a knowing grin. The problem is that most of these people don't read what they are commenting on -- they are just chomping at the bit, ready to say something . . . anything. So, what say is irrelevant or worthless. And if they do, it is with the intent of finding a problem. I do want to say that I have never had that experience on this blog. And I am not just saying that to keep readers. Fortunately, I have cultivated an excellent collection (smallish, though it may be) of sincere readers with a real desire to explore ideas and speak about them thoughtfully. (Or, get this -- to sometimes say nothing and just think about it on their own.) This has not aways been my experience elsewhere with my writing. Mostly, though, I see the self-inflated idiots on other sites that I read. Is this a great letter? It's, at best, a dull platitude about never giving up, and then made worse by poor grammar and excessive use of exclamation points. The writer is certainly great, and so is the relic, but I think some are confusing value of artifact with value of content. I avoid profanity on my blog, but sometimes . . .
as he wants, I say. Bradbury was doing what the greats do. He was writing with his audience -- children -- in mind. And he made a few typos in his kind-hearted rush to answer a letter from a dedicated schoolteacher. I'm sure Captain Grammar would have preferred that Bradbury had regaled the fourth graders with a flawless deconstructive essay on the themes of assimilation and transmutation in "Dark, They Were and Golden-Eyed." It's almost funny to me how often your entries strike a deep chord in my mind. I tend to read and think about what you write far more than I respond these days. Thanks for the thoughts. Thanks, Matt -- either reaction, especially from you, from you is more than welcome!